Over the years, I have learned the importance hand training. As a young boxer, I broke my right hand three times. Each of the injuries occurred inside the ring. At the time, I was ignorant to the importance of hand training. I did not allow sufficient time for the bones to heal between fractures. My ignorance resulted in many months of frustration. An old saying states that hindsight is 20/20. Fortunately, I have learned from past mistakes. Rather than waiting for an injury to occur, I now preach a proactive approach to hand training. Proactive is defined as acting in anticipation of future problems, needs, or changes. This definition is important when considering a hand training routine. You train the hands to prevent future injuries. All fighters can benefit from a regular dose of hand training. The routines are brief, yet highly effective. By training the hands, forearms and wrists, you become less susceptible to injury. A ground fighter also uses grip strength to manhandle his opponent. 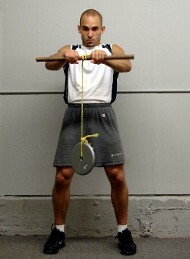 Wrist Roller – Hang a weight from a rope and roll the weight up and down. Work the hands forward and backward. This movement is one of the best forearm strengtheners available. You can attach the rope to a dumbbell handle or any wooden dolly (even a broom handle). Choose a thick handle for an even greater challenge. Rice Grip – Fill a bucket with rice and practice grabbing and twisting the rice in your hand. Forcefully grab the rice with each repetition. You can add a clockwise or counterclockwise twist to the movement to work the wrists. 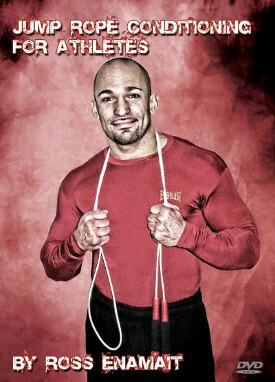 Knuckle Pushups – Perform pushups from the knuckles. This movement is excellent for wrist stability. Fingertip Pushups – A personal favorite movement of mine is the fingertip pushup. This movement is excellent for the hands. Towel Pull-up – Hang two towels (or a rope) over a pull-up bar. Grab each side of the towel with one hand and pull yourself up to the bar. This exercise is deceivingly difficult. It will blast the forearms. Door Grab – Stand directly in front of an open door. Grab it with one hand. Lean the body backwards toward the floor to generate resistance. 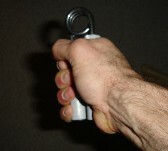 Hold the door tightly to develop pinch grip strength. As your strength improves, you can “sit back” until the thighs become parallel to the floor (as illustrated). Work both hands evenly. 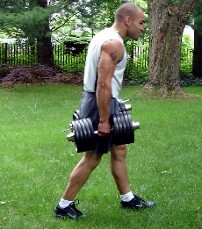 Farmer’s Walk – Grab two heavy dumbbells and walk for distance or time. Walk until you are unable to hold the dumbbells. This movement is an excellent finisher to a strength workout. 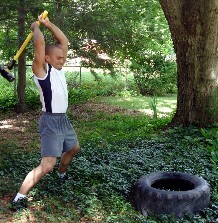 Sledgehammer – Sledgehammer swinging will blast the forearms, strengthen the core, and improve work capacity. You can purchase a sturdy sledgehammer at any hardware store such as Home Depot. Expect to pay approximately $2 per pound. Sandbag lifting – Sandbag training is excellent for grip strength. 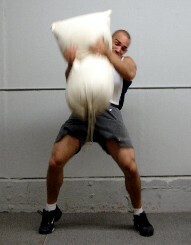 There are an infinite number of movements that you can perform with the sandbag. Two of the best include the Sandbag Clean and Press and Sandbag Shouldering. Both movements are sure to develop grip strength and total body power. Hand Gripper – A quality hand gripper makes an excellent addition to any routine. I have a gripper in my car that I use regularly. The exercises above do not take long to perform. You can always find time for a few minutes of hand training. I recommend 2 to 4 sessions per week. One effective option is to perform several movements as a circuit. These circuits are an excellent conclusion to a strength training workout. You can perform 1 to 3 complete circuits. Perform one quality set for each exercise. Do not push yourself to failure or it will be impossible to finish the circuit. I recommend working to approximately 80% of your 1-set maximum. For example, if you can perform 50 knuckle pushups, stop at 40 reps.
You can also include 2 to 3 days of sledgehammer and/or sandbag lifting. I also recommend regular practice with the door grabbing movement. You can perform this movement sporadically throughout the day. A few minutes of practice will lead to considerable improvements in pinch grip strength (pinching together weight plates is another option). Learn from my mistakes. Make time for hand training.